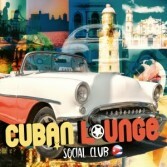 The compilation "Cuban Lounge Social Club" has been produced into the well-known "House Of Glass Studio" by Gianni Bini, one of the most important italian producer. The Saifam Group presents this extraordinary collection containing the most important tracks of the last 10 years, re-arranged in a perfect Cuban mood. A selection of 16 great tracks including "Cheap Thrills", "Hips Don't Lie", "Calma" and many more.